andy’s presence is felt throughout Memphis, but nowhere more so than on Beale Street. A statue of W.C. Handy, with coronet in hand, stands among the trees at the center of Beale Street in W.C. Handy Park…. omments: B. 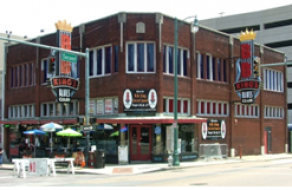 B. King’s Blues Club is a perfect venue for the blues and R&B oldies. I adopted it as one of my favorite clubs the minute I first walked in the door in 1994: King’s is a throwback to times of old, when house parties reigned supreme. That’s what you get every evening: patrons throng to the dance floor or engage in high-spirited audience response whenever the band hits an irresistible groove. A number of photos adorn the walls, including one of the “Blue Boys,” B. B. King with Elvis Presley, as well as photos of Sam and Dave, Al Green, Muddy Waters, and Johnny Taylor. During the 1990s, the King B’s, featuring Ruby Wilson, rocked the house seven nights a week. Rarekas Bonds, one of Ruby’s “kids,” often would come in and dance for you – he’s the boy who tumbled across the screen in the Tom Cruise movie The Firm. B. B. King performs about twice each year. Other national acts have included blues stars such as the late Clarence “Gatemouth” Brown, the late Albert Collins, Buddy Guy, and Irma Thomas. Paul McCartney’s band, Aerosmith, and Eric Clapton have sat in. B. B. King’s also puts on special tributes. One of the most popular was a Stax Records revue that included a tribute to the late great R&B star Otis Redding, and featured his grandson Otis Redding III, Booker T. and the MG’s, Sam Moore, the Memphis Horns, and Eddie Floyd. Blind Mississippi Morris currently is one of the featured acts, hailed by many as one this era’s newest generation of authentic, Delta Blues men. Blues guitarist, vocalist and octogenarian Carl Darvin Drew also is a must-experience. With over seven decades as a performer and entertainer, he still is doing the blues right. Preston Shannon, out of Olive Branch, MS, is yet another Memphis favorite who often is featured here. B. B. King’s main dining room forms a semicircle around the dance floor and stage. An alcove on the second floor also affords comfortable dining while allowing a panoramic view of the stage. The menu ranges from USDA filet mignon to the Southern fried catfish to Cajun carbonara. One of the most requested desserts is the homemade banana bread pudding topped with bourbon glaze and banana caramel sauce. Their corn bread muffins, sweet cole slaw, BBQ beans and collard greens are just the sides to round off a great meal. Although the club seats 400, reservations are recommended. The restaurant serves lunch and dinner daily beginning at 11:00 AM.